In his captivating new book, based on new evidence and a series of interviews, author and scholar Maxim D. Shrayer offers a richly journalistic portrait of Russia's dwindling yet still vibrant and influential Jewish community. This is simultaneously an in-depth exploration of the texture of Jewish life in Putin's Russia and an émigré's moving elegy for Russia's Jews, which forty years ago constituted one of the world's largest Jewish populations and which presently numbers only about 180,000. Why do Jews continue to live in Russia after the antisemitism and persecution they had endured there? What are the prospects of Jewish life in Russia? What awaits the children born to Jews who have not left? With or Without You asks and seeks to answer some of the central questions of modern Jewish history and culture. "Lucid and insightful, Maxim D. Shrayer reminds why so many Russian Jews left the country they once called their own, and explains why those who stayed are still unsure if they belong. Clearly written and very readable." "For anyone with an interest in Russian Jewry or post-Soviet Russia this book is a must-read. Wonderfully written, it is full of thought-provoking insights about the past and future of what had once been the largest Jewish community in the world." 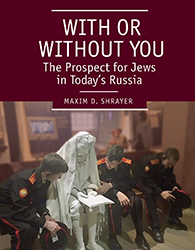 "One cannot grasp the future of the Jews of Russia without reading Maxim D. Shrayer's book." Copyright © Maxim D. Shrayer. All rights reserved.